Bridget graduated from Trinity College in Dublin in 1980 in geology and earned her Master’s degree at the University of Alabama. She received her doctorate from the University of Kentucky, focusing on karst hydrogeology in Kentucky’s Inner Bluegrass region. 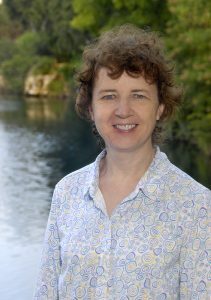 She has conducted research at the Bureau of Economic Geology at the Jackson School of Geosciences (University of Texas at Austin) for the past 30 years, where she leads the Sustainable Water Resources Program. Her research has covered a wide range of topics. Her early research concentrated on groundwater recharge in semi-arid regions, using monitoring, chemical and isotopic tracers, and numerical modelling. She has examined the impacts of climate change and land use change on groundwater, sources and mitigation of natural and anthropogenic contamination, and sustainable groundwater development using managed aquifer recharge. Recent research has emphasized the interdependence of water and energy, including water use for shale oil and gas extraction and electricity generation. She has also evaluated the reliability of global models using GRACE satellite data. Bridget has published numerous papers in refereed journals and has received more than 12,000 citations. She was the 2007 Birdsall Dreiss Distinguished Lecturer. She is a Fellow of AGU and GSA and was inducted into the National Academy of Engineering in 2016. She received the M. King Hubbert Award from NGWA in 2017. Bridget is a member of the Board of Directors of the IAH US National Chapter. She has served as a Co‑Chair of the IAH Commission on Climate Change and is currently serving on the Commission on Groundwater Energy. For several years she performed editorial roles for IAH’s Hydrogeology Journal. Dr Scanlon is an excellent ambassador for IAH and for groundwater. She is a very worthy recipient of the 2018 Presidents’ Award.